* ROSEMONT BAY is a tabletop RPG of "supernatural relationship drama" aimed at fans of shows like DARK SHADOWS, AMERICAN GOTHIC and TWIN PEAKS. At least, it will be if it's funded. The game's creators have launched a Kickstarter campaign to help finance the project, and is a little more than half-way toward meeting its $6,000 goal. Check it out! * The latest installment of DAVID-ELIJAH NAHMOD's new BARNABAS' COLUMN is now up at the FANGORIA website. David takes a look at the career of Jerry Lacy, his lengthy tenure with DARK SHADOWS and his dramatic readings. * Now is the time to stock up on several DARK SHADOWS books. Amazon currently has LARA PARKER'S first novel, ANGELIQUE'S DESCENT, for a mere $6, while her follow-up, THE SALEM BRANCH, is a stunning $5.20. Meanwhile, KATHRYN LEIGH SCOTT and JIM PIERSON'S DARK SHADOWS: RETURN TO COLLINWOOD, is $1.99 on Kindle. 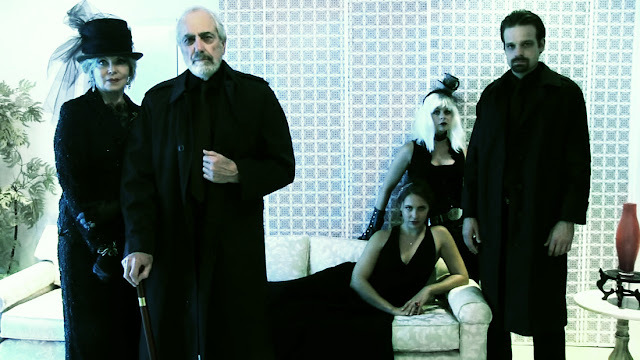 Lara Parker as Madame Carrozza, Jerry Lacy as Dr. Mabuse, Bahia Garrigan as Christina Novello, Kate Avery as Maria, and Nathan Wilson as Lohemann.